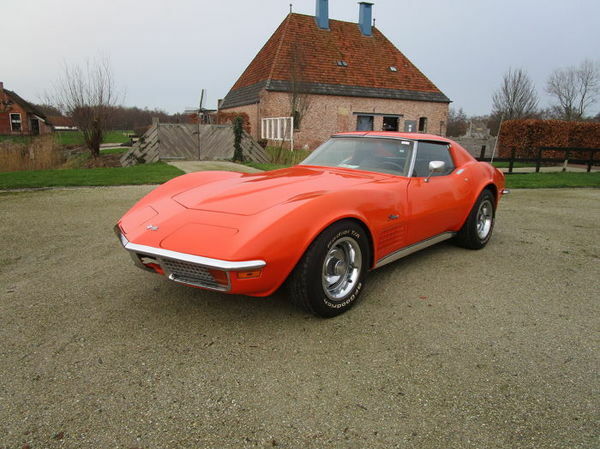 Chevrolet Corvette Stingray C3 with T Tops and Chrome bumpers. The previous owner bought it from the son of the owner at the time who had the car stored in a garage in Phoenix for 25 years (as a stranded project). Recently fitted with a new crate engine and a 400 turbo transmission. Very neat car, totally rust-free. Power braking and power steering. The engine runs nicely and the automatic transmission shifts properly. Wide rally wheels with chrome rings. Vacuum headlights and windshield wipers (connecting). Import W DC: all import duties and VAT paid.